Fully X, Y, Z Adjustable Laser Rotary Attachment. 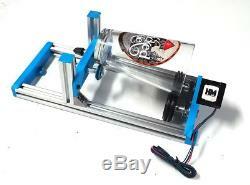 For K40 Engraver & Larger. I was asked a while ago to design a rotary for a customer who wanted to engrave mugs. Because my other (Version 1) less expensive rotary could not perform that task. Check my other auctions for Version1. Without one single unhappy customer. It had to be simple to use. Must allow fast adjustments between shapes. I'm a very visual person, so it had to look great! It also had to be expandable for use in something larger than a K40. It must be able to engrave items with handles. Must be as low profile as possible as there is not much room in a K40. Come in different colors to closely match your laser. Will receive whatever color I feel like printing that day. And after many, many design hours later, what I came up with greatly exceeded all my expectations. Each one is custom built at the time of sale. Now comes with Red Silicone O-rings on drive wheels with at least 3 times the grip. Now comes with an extra piece for those small items that may extend past the uprights. 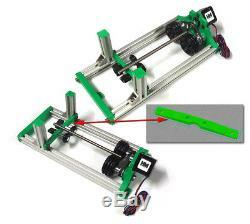 The non drive wheel uprights slide back and forth in the 12 2020 extrusions to match the length of your piece. Loosen them up, then lock them down. Designed so that the non-drive wheels will move in and out together to keep your piece centered. 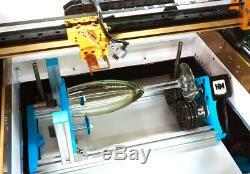 Unlike other sellers, the only parts 3d printed are the ends and wheel rims. Everything that moves or rotates, is made of aluminum or steel. Which gives you far more accuracy than any 3d printed drive gears. A few dollars more expensive, but what's that old saying? You get what you pay for. And once you place your order, you will be supplied with my contact info, In case you have any questions. No additional motor drivers or power supplies are necessary. This will run off of your existing laser control board, Including your Cohesion Board. 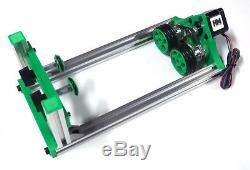 For your K40, you simply need to unplug your y axis motor and plug this in. If it runs backwards, just reverse your connection. 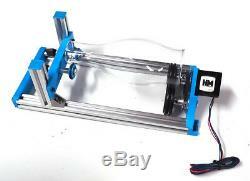 Nema 17 Stepper Motor Bipolar. Holding Torque: 0..42N·m (59oz·in). Rated Current/phase: 1.5 A. Phase Resistance: 1.6 ohms. Rated Voltage (driving voltage) : 2.4 V. Inductance: 3.8 mH ±20%. 48mm Body4-lead W/1m Cable and Connector. The motor mount also has slots to keep belt tensioned if it ever starts to stretch. Use of all metal parts means a more accurate rotary attachment. Aluminum Gt2 motor timing gear. 3d printed roller wheels with rubber o-rings and aluminum hubs. Easily expandable to longer than the 12 2020 extrusions if you choose. Each of the end plates of your HM Rotary has mounting holes. 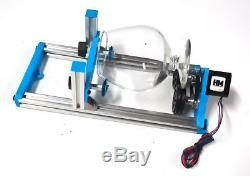 So you can mount this to the bottom of your laser, or to another plate. Depending on the size of your work piece, you may or may not have to cut the. Bottom out of your K40 to gain the proper laser head distance to your piece. No need for an assembly manual as it will arrive 99% completed. Just attach the two ends and the uprights to the provided 2020 Aluminum extrusions. And if you are running it on a K40, once you remove your stock y motor connection and turn. Your machine on, you will notice this rotary will continue spinning. That's because your y motor end stop has not been activated. SO just fool it by manually moving your z towards the back of the machine to fool it into thinking. That your stock y axis has reached it's limit. 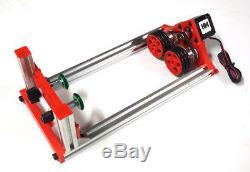 Because some laser motherboards may be different, a wiring diagram for the stepper motor will be supplied. As you may have to reverse wires to spin the motor in the correct direction. And if you are running Corel Draw with Corel Laser, follow this. 54.2500 mm is the diameter of the wheels on your HM Rotary. Supply me with your 1st and 2nd color choices. 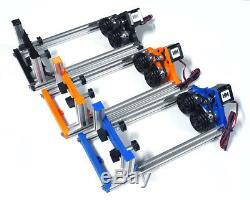 As more parts arrive to fabricate these, more will be available. 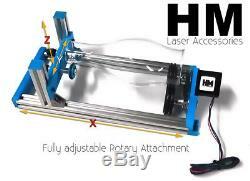 The item "HM V2.1 Fully XYZ Adjustable Laser Rotary Attachment for K40 Engraver & Larger" is in sale since Thursday, November 15, 2018. This item is in the category "Business & Industrial\Printing & Graphic Arts\Screen & Specialty Printing\Engraving". The seller is "wwwholgamodscom" and is located in Fulton, New York. This item can be shipped to United States.